Tag Archives for " Fear "
Fear in the context of trust: Expand your focus to ease your way through difficult emotions. I am on the toilet. Time is meaningless to me. I have danced too far along the path to meet my baby to be completely rational. Only thing is, neither me nor my husband have quite caught up to fast pace of my baby’s arrival…He is about to trot off to try and put the pool up. I am about to have the baby in the timeless eternity that has inserted itself into about 15 or 20 ordinary minutes. As I said I am on the toilet. I won’t go into detail but to say that it is an intense experience is an understatement. For a moment I begin to panic. What is happening to my body? Is this normal? How can so much power be coming through this small person? Will I cope? My mind was worried for me and the concerned thoughts were triggering more layers of anxiety… Oh OK then, more like terror, that hovered just on the edge of my awareness threatening to take over. But wait there was something else too. I changed focus to my body. Instead of floating terror there was a grounded peace. It was pale yellow and surrounded me on all sides, present both inside and out. My body actually wasn't touched by the fearful thought, it was just getting on with its job and was completely confident. All was well. Now I had a choice. Did I reside in the terror and let it take me, or did I allow the peace to breathe me. For a few minutes there was a bit of to and fro movement. Then I made the choice. Or the choice made me. My heart opened up in gratitude and softened in the peaceful energy. My body began to push and I started roaring like a lion. I realized as I journalled later that it didn't matter that I felt terror because I was bathing in a different energy that was so strong and confident that it could hold the terror. This was my fear being held in the energy of confidence and peace. As long as I tuned into this greater awareness that was holding me I was OK. It was more than OK. It was liberating. I could allow all of my experience to flow through, even the tricky, so called negative emotions. 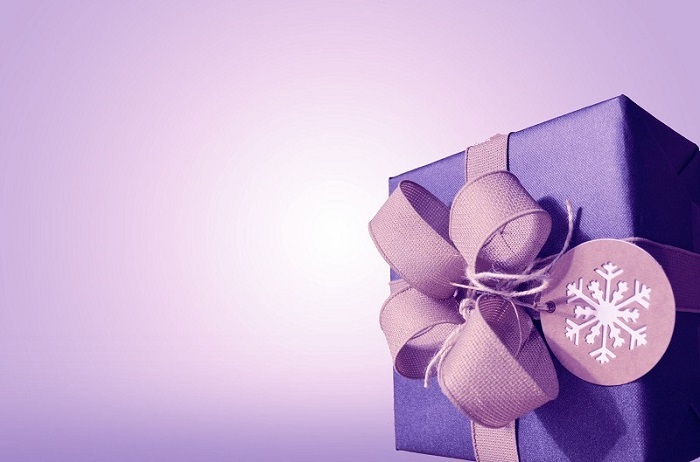 This gift of being held in a wider perspective that could hold my less desirable emotions was revealed to me through a tool called The NPA Process. 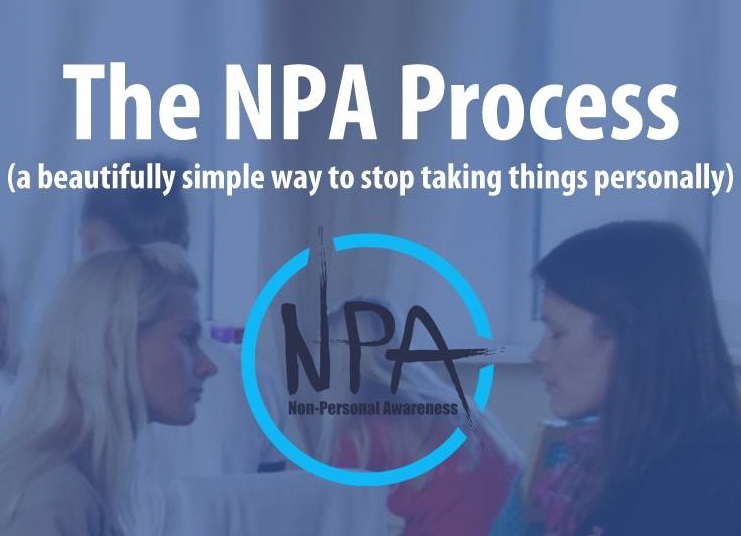 The NPA Process is a deceptively simple 6 line spoken-word transformational tool created by Joel Young that helps you let go of blocks and powerfully shift your consciousness. It was during a practice session on an NPA Community Call that I first experienced the power of accessing a different context in which to allow something challenging to be fully met. Fear rose up strongly in me during the call and I thought I wanted the fear to go. To disappear and leave me alone so I could experience something more fun, more pleasant, like say peace or joy and also get the satisfaction of feeling, Yes I've cracked it and got rid of my fear… Nope. Like mist lingering in the lower reaches of a valley untouched by the rising sun the fear persisted, heavy in my stomach, rubbing up against my shoulders, gripping me by the chest. I was about to be disappointed and frustrated when the shift happened. I suddenly felt trust. A deep powerful trust in life and in the process. I trusted that I would be OK even with fear present. It felt like angels whispering in my ear that all was well. It felt like a reassurance I could believe in, that I could depend on and.,. well that I could trust. This was fear in the context of trust. It was slightly surreal to feel both simultaneously, but was a greater gift in the long term than getting rid of the fear would have been. It meant I no longer had to be so scared of feeling fear. It meant I didn’t have to wipe out every last drop of fear from my being to be sure I would be successful. It meant I could live in peace with fear and hear her gentle messages and the wisdom she was paradoxically guiding me towards. It also gave me choice when fear came up and this certainly served me giving birth. No matter how much emotional preparation we do for birth, (and I did lots), it is impossible to predict what may happen and to what depths of your soul the labour dance may take you. 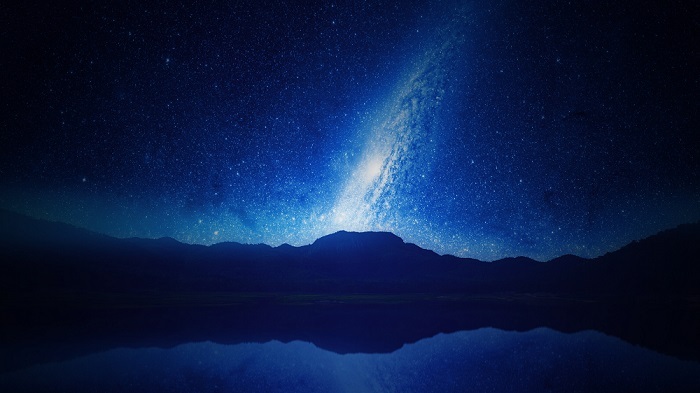 Knowing I was held at every moment and could choose where to put my attention was reassuring to the doubting, worried parts of me that weren't up to speed with the all is well nature of my birth experience. Back to the toilet. Fear and terror didn't stay there for long in the end and neither did I. As I focused on trust and peace, the space opened up around me and I opened up with it. Gradually the fear dissipated on her own and I moved to the shower. Somewhere along the three steps it took, (we have a small bathroom,) another shift happened. Those three steps danced me too far along the labour dance to listen to my mind anymore and I just kind of got on with it with no more drama or story. I finally accepted what was happening and quietly dropped down into my womb and went to meet my baby. If you are plagued by fear and would like to experience some shifts of your own check out my 1:1 services or book a clarity call to see how I can help you. Fear: Friend or foe? Shift your perspective with a helpful acronym. How do you respond when fear grabs you suddenly? Fear can be tricky and confusing. It’s hard to maintain perspective when you are in the throes of a strong emotion like fear. It can Impair your intuition and cloud your usually good judgment. Is it a genuine warning signal of danger to act on now or is it overblown panic triggered by old memories stored in your cells or negative thought projections? 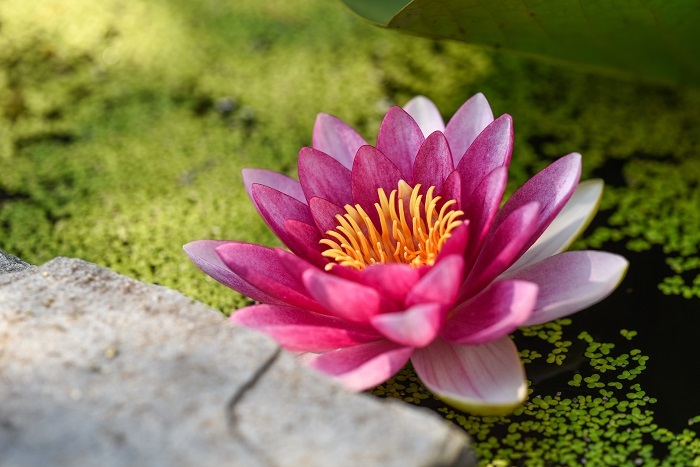 Sometimes a little bit of time breathing into the emotion in a space of stillness is enough to bring you back to the ground and allow some inner wisdom to penetrate. Sometimes it takes a little more and over the years I have found lots of helpful little tips to support me to reframe my experience. At first I used to panic and shutdown when I felt the stirrings of fear in my belly. When fear ran riot I would feel the urge to run, to shut it down, to do anything other than sit in stillness and let it run through until I could feel a more solid base through the emotion. I thought of fear more as an enemy and obstacle to overcome than a friendly messenger. I saw her as something to push away or push through and had no idea of the possibilities that would open up if I welcomed her and experienced her with as much willingness as I would joy or happiness. This pattern was particularly acute in pregnancy. I was vulnerable and open like many pregnant women. Birth is not an activity you can repeat until you get it right, nor is it entirely predictable and I felt the pressure which fuelled my fear. I persevered with the innerwor﻿k and nowadays I see her as a useful friend who serves to keep me on track and motivates me to dig deeper for freedom and peace. Not necessarily a comfortable friend mind. The physical sensations that alert me to fear are the same, quickening of the pulse, shakiness in my belly for example. I can still get scared when I’m feeling fear. But I have a number of tools and tips that help me out. One of the earliest breakthroughs came from playing with the letters of the word itself. I created an acronym that totally freed up my way of experiencing fear. This ability to let the scaredness run through without letting it run me into hasty fear based decisions took some practice. 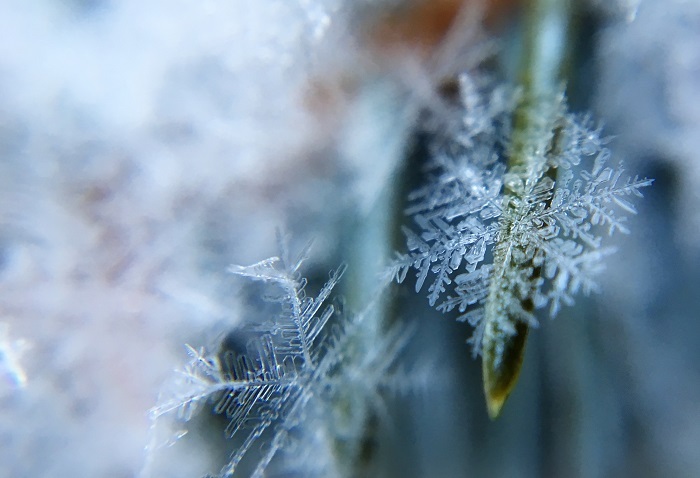 I had deep grooves and was used to freezing up in the face of fear. However, with a new perspective I suddenly found fear much easier to handle and without squashing it down was able to work with it and still keep going towards my goals. I remember the first time very clearly and use it as a reminder whenever I forget. The overwhelmingly frightening experience of fear as stronger than me dropped away and I moved from powerlessness to an exciting sense of possibility. Ok so enough explanation. Here are my two perspectives on fear: The first is the way I used to experience and see fear and the second is my experience using my acronym. F.E.A.R. Frightening Energy Always Returns. Looming blackness hovering round the edges of my vision, dread, like a dead weight pulling down at my stomach, pulling my leaden feet down into the earth so I can no longer move, crushing my chest so I can no longer catch my breath. Panic, swirling round me so fast I can’t keep up or make sense of the sensations. I can’t think straight. It’s stronger than me. I don’t know what to do. I can’t do it anyway. I just want to get out of here. Now. F.E.A.R. Fresh Energy Appearing Rapidly. I notice the quickening, in my breath, in my being and all around me and I stay still. I know it is just energy. I feel it moving fast towards me and through me and I keep breathing. Even though my breath catches at first, I stay with it. I send myself love and compassion and I wait. I breathe more deeply and I find I can appreciate this strong energy as it moves and I stay still in it. I notice the speed of the energy. I feel its vibrations. It buzzes. I keep breathing and I am still alive. I calm and I begin to see. I am still here. The whole world has not ended. All will be well. I am brave and I open fully into the energy and I move through it. I remember that I can do this. The message becomes clear and I can move beyond, richer for the experience, stronger for the journey. How differently did you feel as you read each description? If you read quickly skimming through then have another go. You may like to take a pen and paper or journal to note down any insights. Shake yourself into a neutral place before starting then go back and read each one again slowly. Feel your way into each statement and notice how you are sitting, how you are breathing and how your body responds to the words. After the first statement bring yourself back to neutral then read the second one through in a similar way. How did you experience it this time? Of course the trick with any tool is to remember to use it especially in the beginning. If you like this idea write it out and pin it up somewhere prominent and try reading it out when you next feel fearful. Take a few minutes just to feel the energy moving whilst you stay still and see where your stillness leads you. 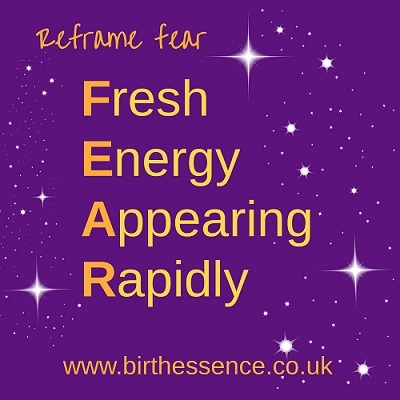 No matter how much emotional preparation we do during our pregnancy (and I do highly recommend innerwork and emotional preparation) we cannot be sure we will not meet our old friend FEAR just around the corner at an unexpected and possibly vulnerable moment. Shifting my perspective and transforming my relationship with fear has been fantastically freeing for me and I hope you will also benefit. Do let me know in the comments how you find it.